Is it snowing in Mt Hood Meadows ?Thank you! Issued: 10 pm 24 Apr 2019 (local time). The snow forecast for Mt Hood Meadows is: Mostly dry. Freeze-thaw conditions (max 14°C on Thu afternoon, min -2°C on Fri night). Winds increasing (calm on Wed night, strong winds from the WNW by Sat afternoon). Mt Hood Meadows Weather (Next 3 days): The snow forecast for Mt Hood Meadows is: Mostly dry. Freeze-thaw conditions (max 14°C on Thu afternoon, min -2°C on Fri night). Winds increasing (calm on Wed night, strong winds from the WNW by Sat afternoon). Mt Hood Meadows Weather (Days 4-6): Light rain (total 2.0mm), mostly falling on Tue afternoon. Freeze-thaw conditions (max 8°C on Tue afternoon, min -4°C on Sat night). Mainly fresh winds. Light rain (total 2.0mm), mostly falling on Tue afternoon. Freeze-thaw conditions (max 8°C on Tue afternoon, min -4°C on Sat night). Mainly fresh winds. Mostly dry. Freeze-thaw conditions (max 14°C on Thu afternoon, min -2°C on Fri night). Winds increasing (calm on Wed night, strong winds from the WNW by Sat afternoon). The above table gives the weather forecast for Mt Hood Meadows at the specific elevation of 1379 m. Our sophisticated weather models allow us to provide snow forecasts for the top, middle and bottom ski stations of Mt Hood Meadows. To access the weather forecasts for the other elevations, use the tab navigation above the table. For a wider view of the weather, check out the Weather Map of United States. in or near Government Camp? Extremely crowded on popular days, generally crowded on any days. The staff seem indifferent to customers. Even first chair public rarely see fresh tracks, ski patrol usually has all the lines skied for "patrol safety" or whatever term is used. Snow Park permit required. If it wasn't close to where I live, I'd definitely consider other resorts as better alternatives for the same price. Just my two cents though, some people love this place. I've literally spent a full day with my phone showing 60% of 9AM to 4PM as "standing in line". Of course, it's just a cellphone so how accurate is the GPS. 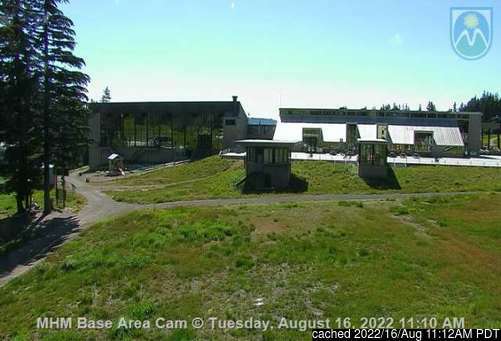 The Mt Hood Meadows skiing weather widget below is available to embed on external websites free of charge. It provides a daily summary of our Mt Hood Meadows snow forecast and current weather conditions. Simply go to the feed configuration page and follow the 3 simple steps to grab the custom html code snippet and paste it into your own site. You can choose the snow forecast elevation (summit, mid-mountain or bottom lift) and metric/imperial units for the snow forecast feed to suit your own website…. Click here to get the code.